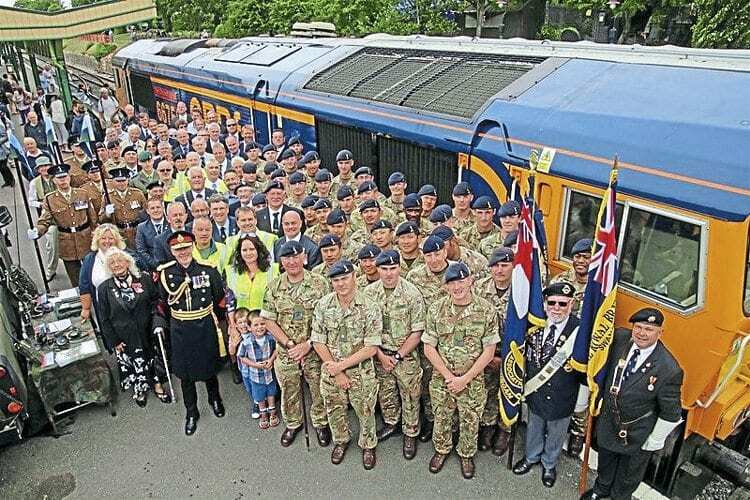 TWO recent GB Railfreight locomotive namings have further cemented the close ties between the operator and the UK armed forces. GBRf and the Royal Corps of Signals named No. 66756 Royal Corps of Signals at a ceremony on June 24 to mark Armed Forces Day celebrations in Swanage. GB Railfreight named No. 66756 Royal Corps Of Signals on June 24 as part of the celebrations for Armed Forces Day in Swanage. It marks a long association between the Swanage Railway and the Corps, which has played an important role in the restoration of the railway. The locomotive was named by John Smith, GBRf managing director, and Major General John Crackett of the Royal Corps of Signals. On July 11, it was the turn of the Royal Navy when No. 66775 (carrying the number F231) was named Argyll at Drake’s Halt in Plymouth Devonport. The loco is named after HMS Argyll, the longest serving operational Type 23 frigate in the Royal Navy. The 4,900-tonne vessel recently returned to active service after a refit at Devonport.